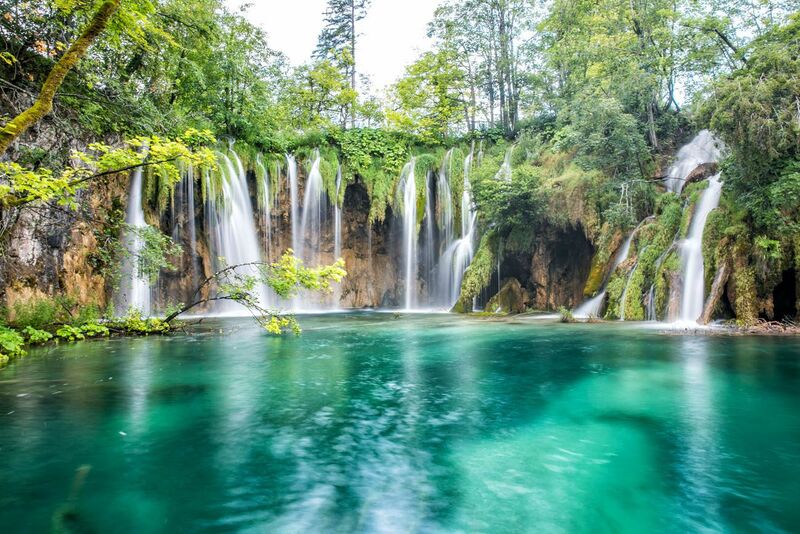 Plitvice Lakes is one of the most unique places to visit in Croatia. 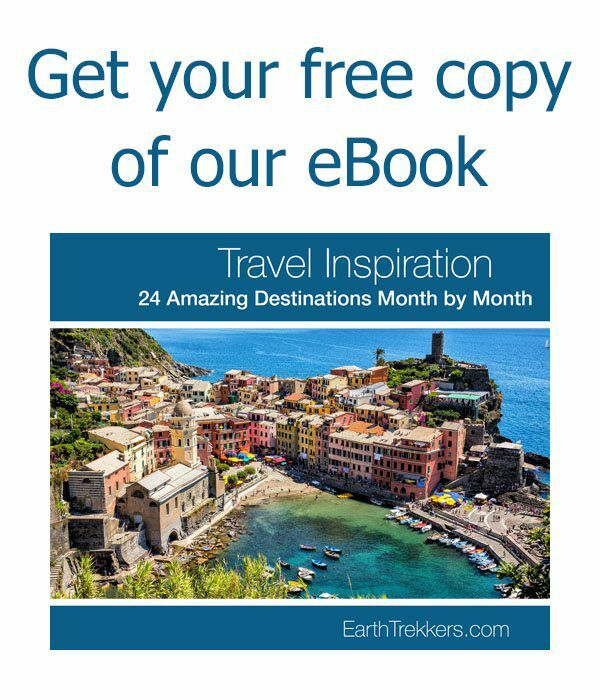 With easy walking trails, boardwalks suspended over the turquoise water, stunning viewpoints, and photogenic waterfalls, this is the type of place that is perfect for visitors of all ages. 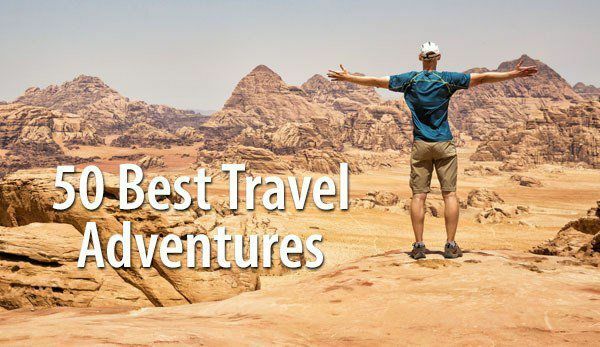 With different levels of lakes, four different hiking trails, seven routes through the park, and two different entrances, it can be overwhelming trying to figure out how to spend your time here. 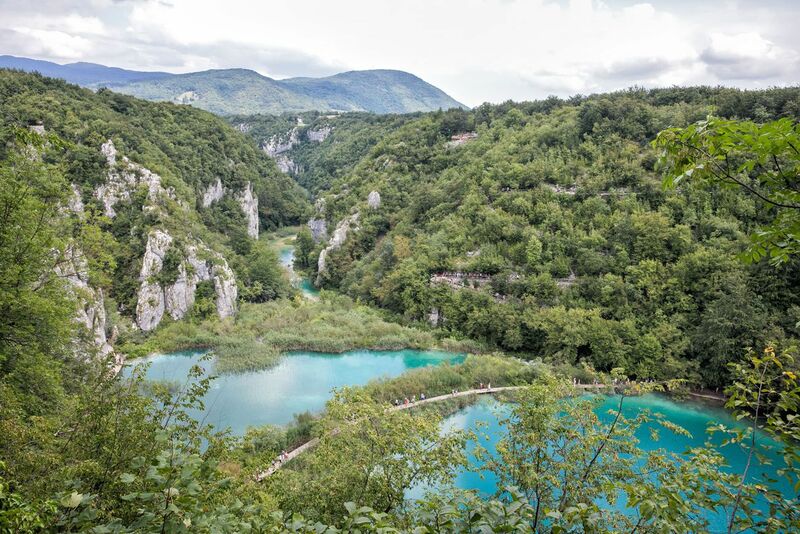 In this article, I will share with you our walking route through Plitvice Lakes. 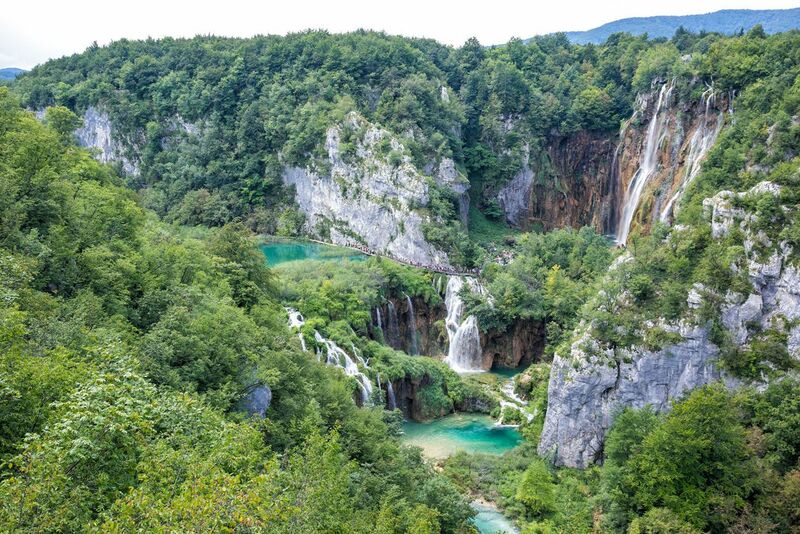 Learn how to get to the most stunning waterfalls, how to get a bird’s eye view of the park, and how to get to the Veliki Slap viewpoint for the postcard view of Plitvice Lakes. Simply said, it’s gorgeous here. 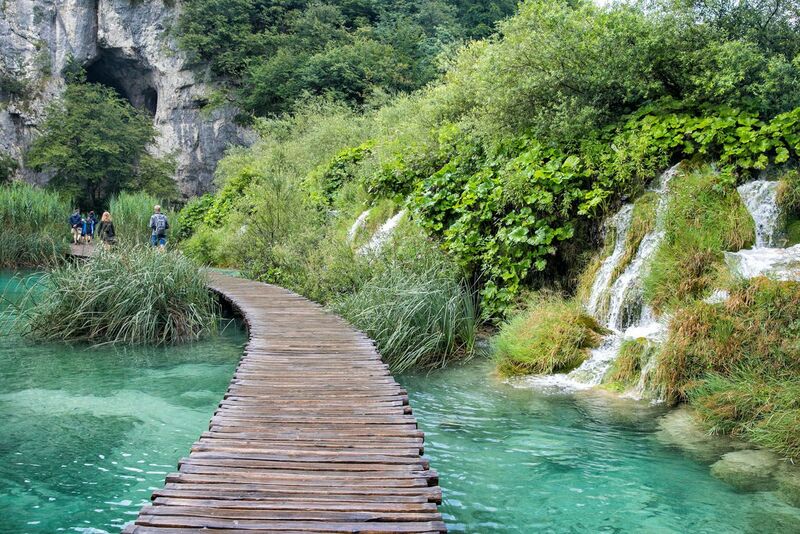 Lakes, waterfalls, and cool boardwalk trails all work magically together to create a very unique destination. Around every bend is another beautiful view. 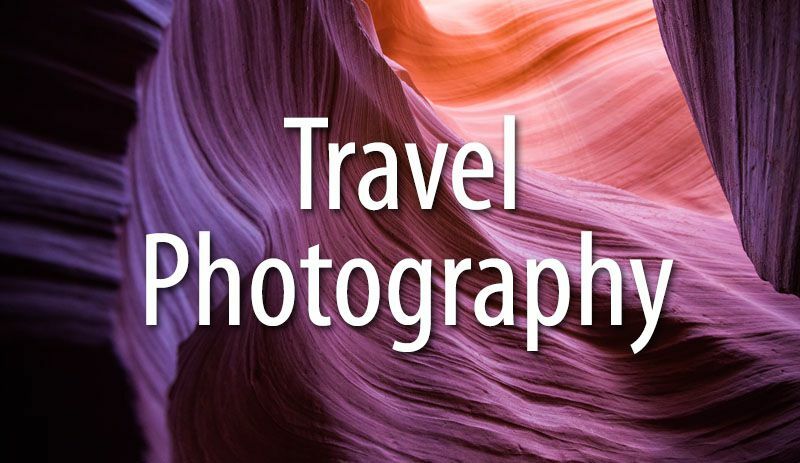 Be prepared to ooh and aahh and takes lots of photos. 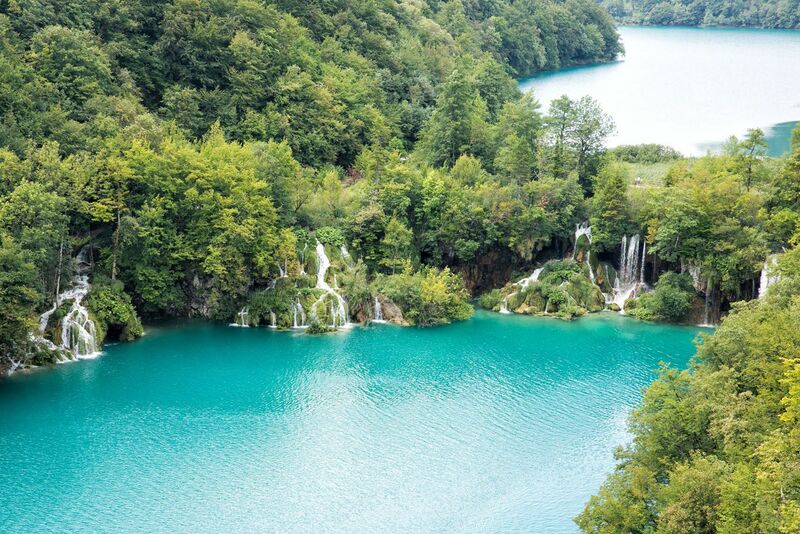 Plitvice Lakes National Parks contains 16 interconnecting lakes that vary in color from emerald green to turquoise to deep blue, depending on mineral content and lighting conditions. Throw in those waterfalls and you really have something special. 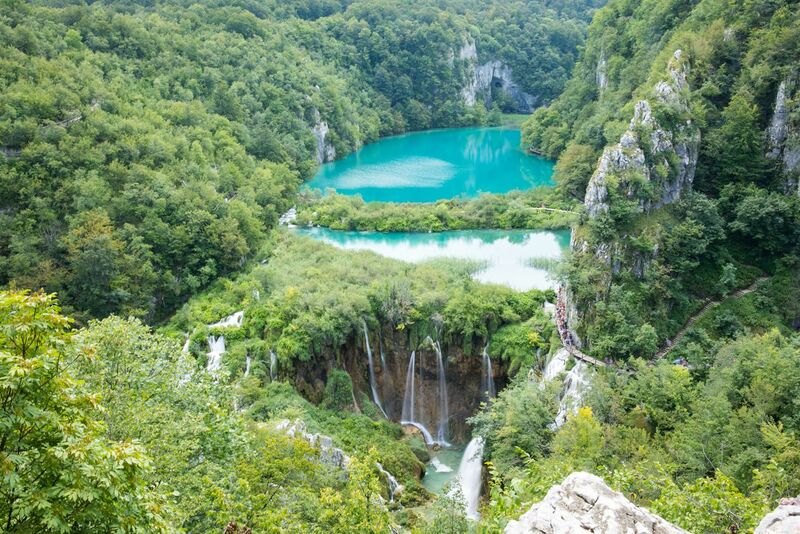 In 1979, Plitvice Lakes became a UNESCO World Heritage Site. This is one of the most popular tourist attractions in Croatia, receiving over 1 million visitors per year. 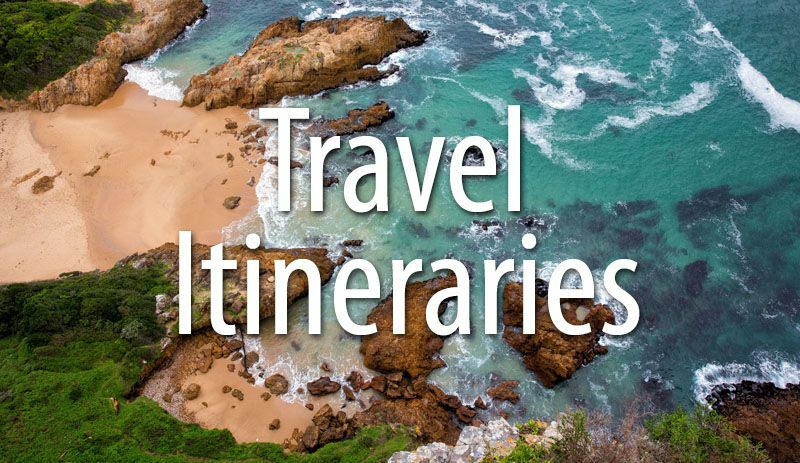 Many come during the summer months, so if you are planning a trip from June through August, expect big crowds. 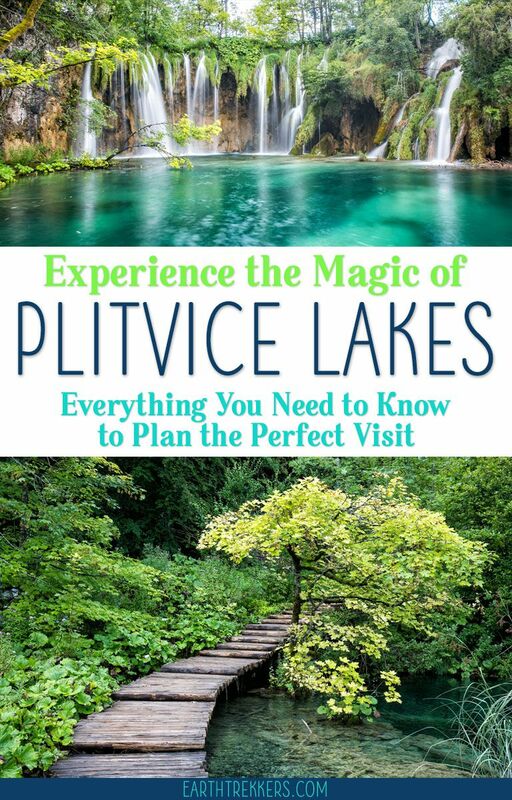 It is possible to visit Plitvice Lakes on a day trip from Zagreb, Zadar and Split. However, you will spend a lot of time in the car. If you are doing this in the summer months, you will most likely arrive at peak time when the boardwalks are congested with lots of people. For the best experience, plan to stay overnight near the park so you can have an early start to your day. It’s worth it! 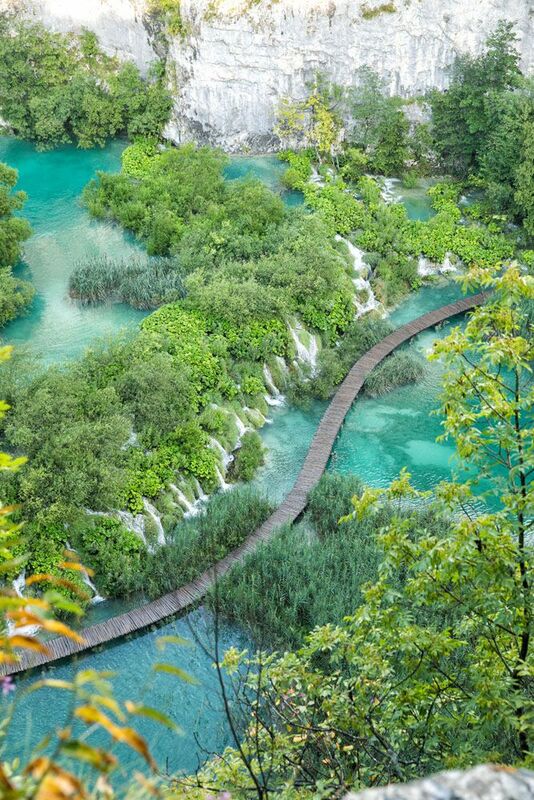 Plitvice Lakes National Park covers over 73,000 acres. There are four hiking trails that are organized into 7 different routes to tour the park. 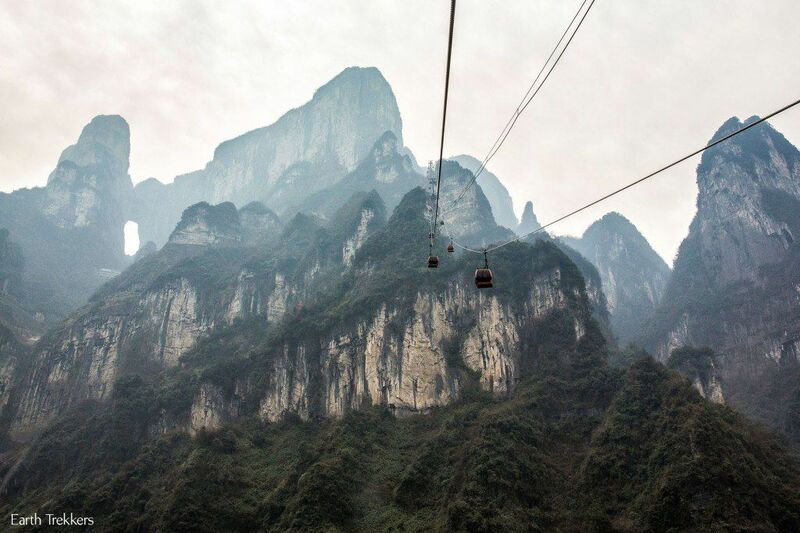 Other than hiking, you can also get around by boat and by shuttle (also called the panoramic train). It’s easiest to think about the park in three different sections. The lower lakes section includes Entrance 1 and Veliki Slap (the Big Waterfall). From here, you can take a boat or the shuttle to the upper lakes section, with some of the prettiest boardwalk trails and waterfalls in the park. Beyond this is the third section, a trail around Proscansko Lake. There is another section to the park that is not included on the main routes. There is a road and trail that runs along the western cliffs of the park, offering very nice aerial views over the lakes and boardwalk trails. 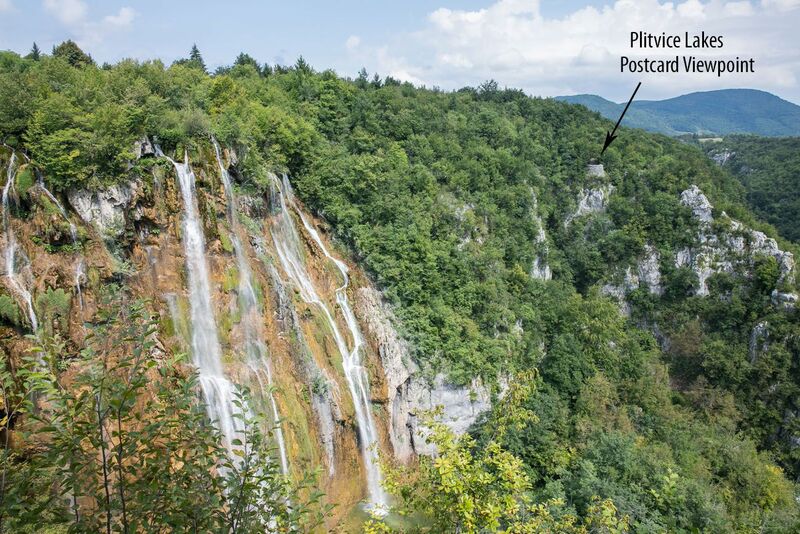 This also includes the Veliki Slap viewpoint for the postcard photo of Plitvice Lakes. 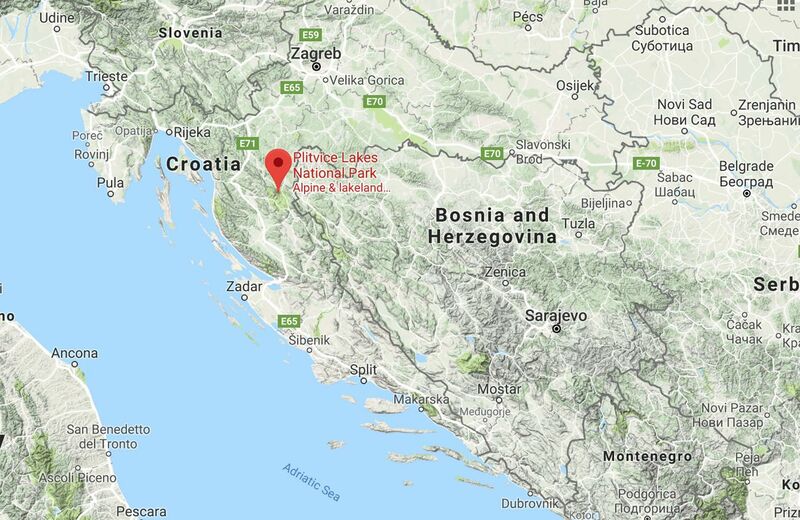 This is a modified map from the Plitvice Lakes National Park website. 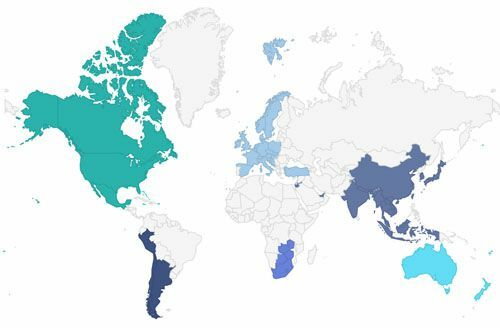 Note that the map is rotated 90 degrees – north is on the right side of the map. There are seven routes (also called programs) through the park. These are suggested routes depending upon your starting point, your energy level, and how much time you have. 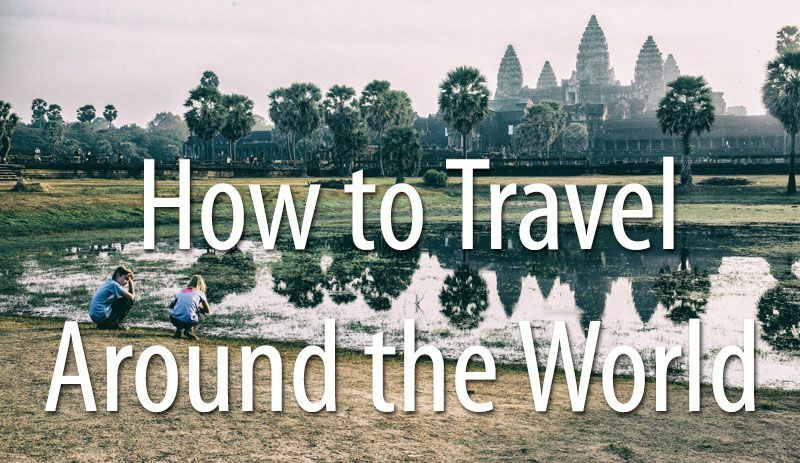 With seven options, picking out the best route can be a little overwhelming. At the end of this section, I’ll give you our suggestions. Programs A, B, and C all start at Entrance 1. Programs E, F and H all start at Entrance 2 and are basically the same as A, B, C only they travel in the opposite direction. Program K is a full day hike through the entire park. 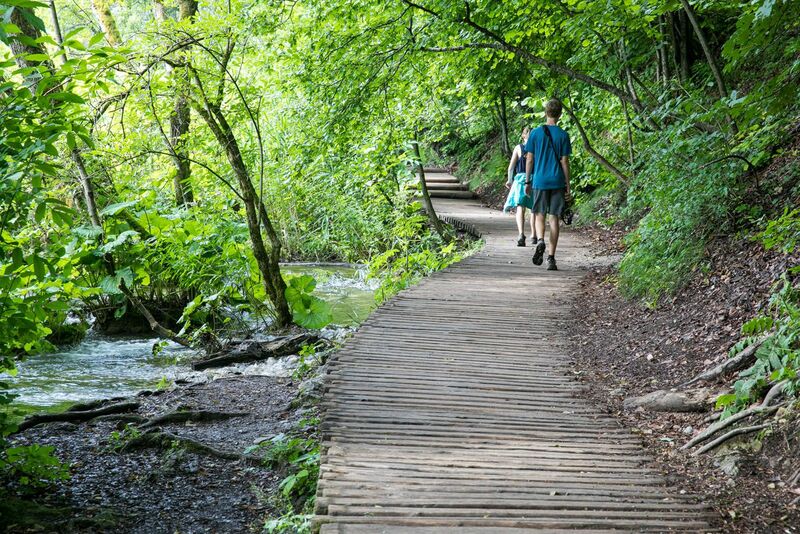 This trail starts at Entrance 1, goes downhill to the boardwalk trails where you will see Veliki Slap and waterfalls along the lower lakes. At Kozjak Bridge you turn around and then walk or take the shuttle back to Entrance 1. 2 – 3 hours, 3.5 km, easy. 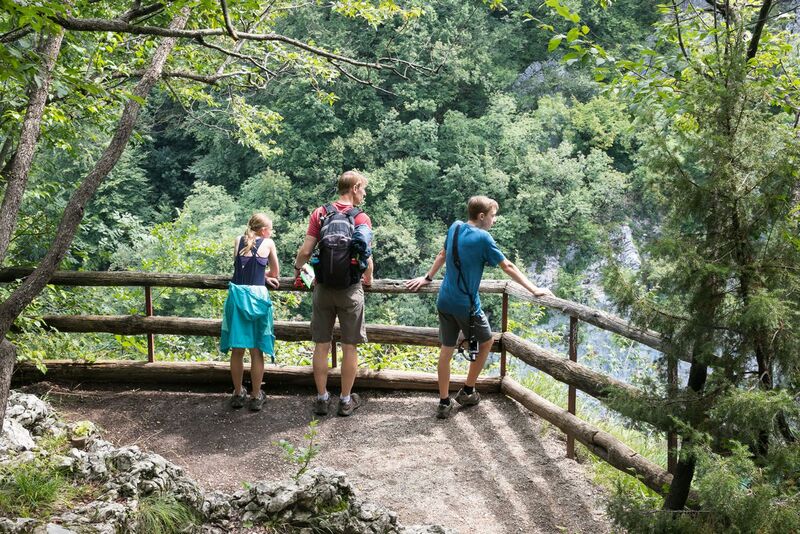 This is Program A but you cross Kozjak Bridge, take the boat to the other side of Kozjak Lake, and return to Entrance 1 by shuttle or by the walking trail along the lake. 3 – 4 hours, 4 km, easy. Program C is a continuation of Program B. 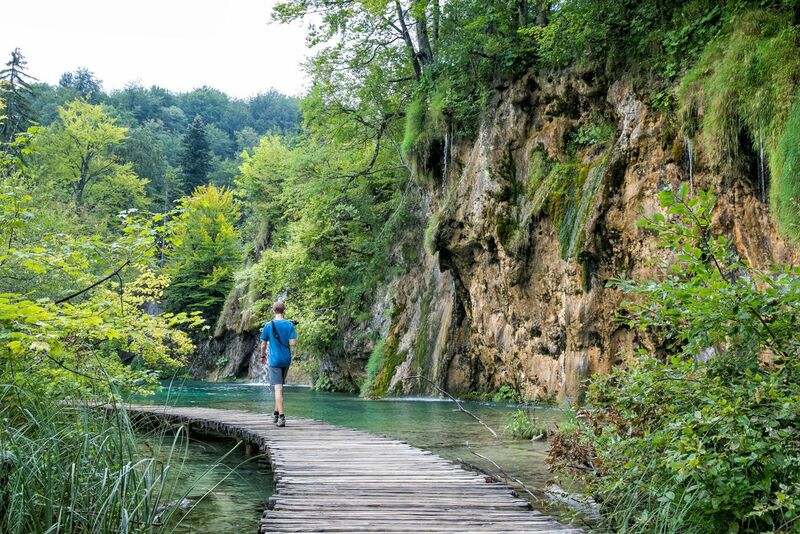 Once you disembark the boat on the far side of Kozjak Lake, you walk the boardwalk trails along the upper lakes and waterfalls. Take the shuttle back to Entrance 1. 4 – 6 hours, 8 km, easy. Starting at Entrance 2, you ride the boat across Kojzak Lake and walk the trails through the upper lakes and waterfalls, ending back at Entrance 2. 2 – 3 hours, 5.1 km, easy. 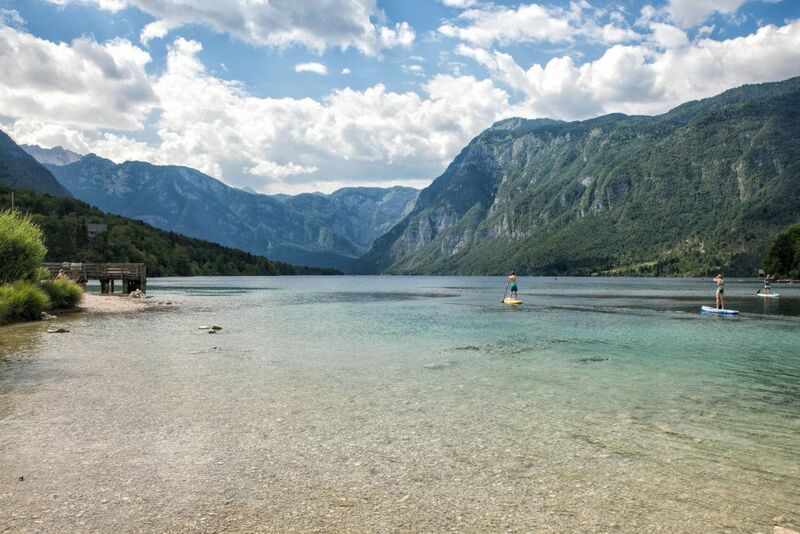 From Entrance 2, take the boat across Kozjak Lake and walk the trails around the lower lakes. To get back to Entrance 2 take the shuttle or walk the hiking trail. 3 – 4 hours, 4.6 km, easy. Take the shuttle from Entrance 2 to the top of the upper lakes (St3). 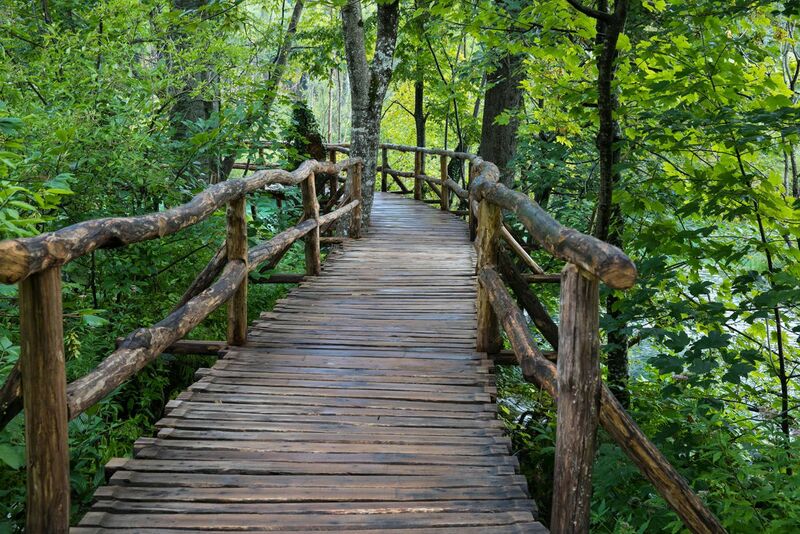 Walk the boardwalk trails along the upper lakes until you get back to Kozjak Lake. Ride the boat across Kozjak Lake and walk the trails along the lower lakes. From Entrance 1, ride the shuttle back to Entrance 2. 4 – 6 hours, 9 km, easy. This is an 18.6 km walk through all of the lakes of the park. Basically, you are hiking around all of the lakes without taking the boat or shuttle. It’s absolutely worth it to visit both the lower and upper lakes if you have the time. In order to do this you will need to do Program C (from entrance 1) or Program H (from Entrance 2). 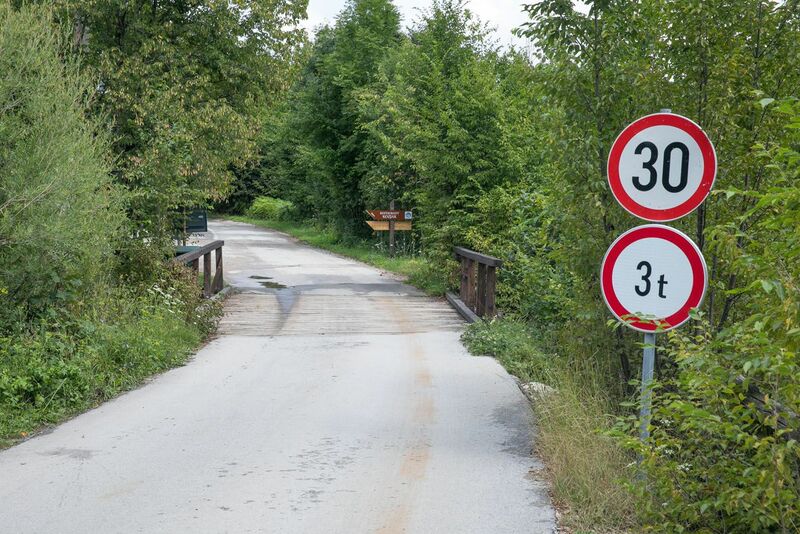 If you are short on time, you will have to choose between the upper and lower lakes. Which one is better? 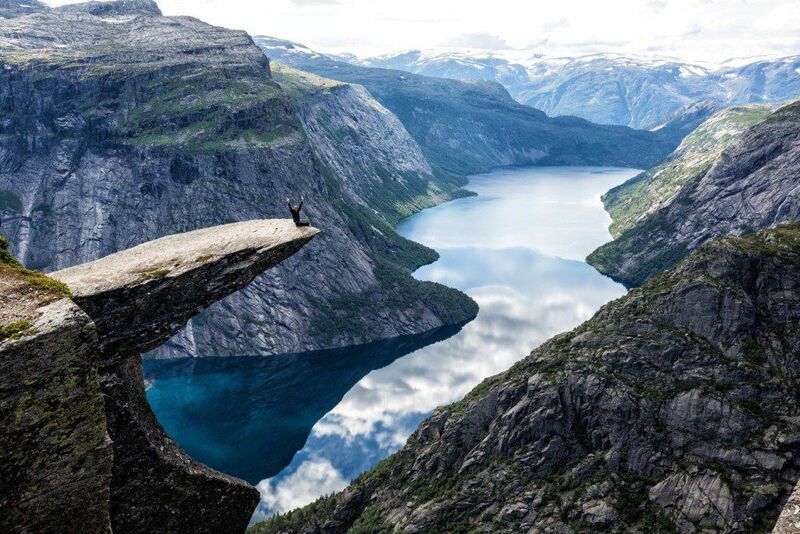 Both sections feature stunning waterfalls and lake views and you can’t go wrong with either. But I think the waterfalls of the upper lakes are slightly better than the lower lake section. Should You Start at Entrance 1 or Entrance 2? If you walk in the opposite direction, you will actually walk past some of the waterfalls and have to keep turning around to look at them. It’s not a big deal but I think it is a nicer experience to walk towards the waterfalls. We walked the boardwalk trails in both directions and preferred starting at Entrance 1. Pro Travel Tip: Prior to our visit, I had read that starting at Entrance 2 is better because you are walking against traffic most of the way. On the day we did this (a weekday in mid-July), there seemed to be just as much traffic moving in both directions on the trails. So, from a “traffic” standpoint, I don’t think there is an advantage to starting at Entrance 2. 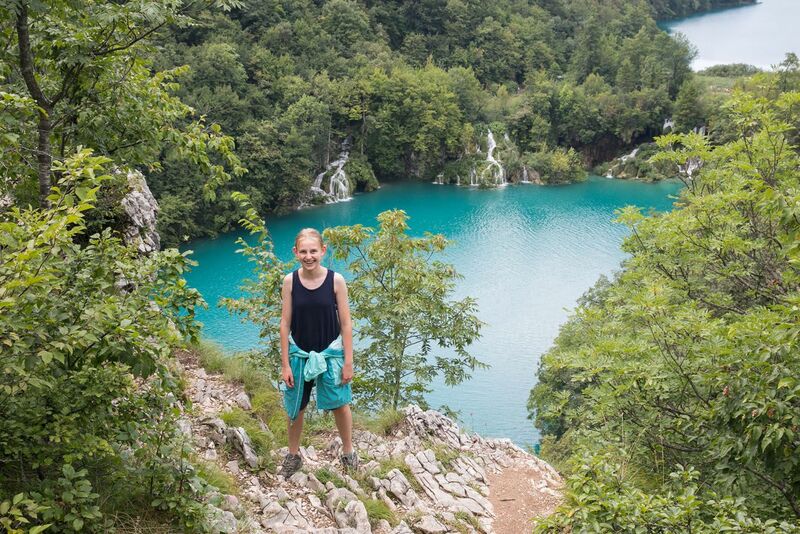 Over the course of a day, we walked back and forth along these boardwalk trails in both directions, took the shuttle, road the boat, walked the hiking trails on the cliffs along both sides of the lakes, explored various viewpoints, and took in the view from Veliki Slap viewpoint. In total we walked over 20 km (12.5 miles) to come up with this route through the park. Don’t worry, you won’t be walking 20 km like we did (we did a lot of backtracking). This route is much shorter. I don’t have an exact distance but I would estimate this route to be about 11 km. Our route is basically Program C with some extra viewpoints thrown in. Start at Entrance 1. I highly recommend getting here right at opening time (7 am during the summer, 8 am the rest of the year). To walk these boardwalks with minimal traffic is a wonderful experience and this is your best chance to take some very cool photos with few people in them. The view from the overlook at Entrance 1. Pro Travel Tip: The trails really get busy around 10 am. By getting here at 7 am (in summer), you have about 3 hours before the boardwalks get swamped. This is just enough time to walk the lower and upper falls. Take the trail down to the lakes and walk the boardwalk trails. 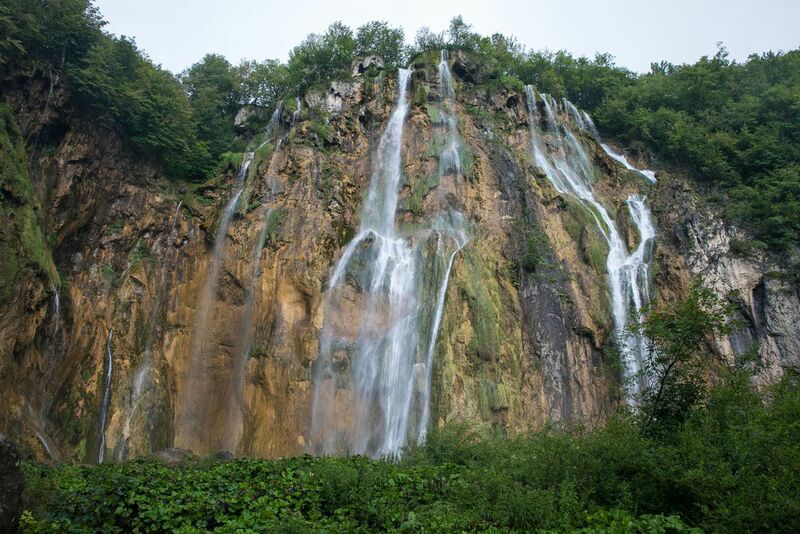 Take the short detour to Veliki Slap, the Big Waterfall. Optional Detour: Right next to Veliki Slap is a staircase leading to the upper level of the cliffs. This takes you to several great viewpoints over the park as well as the postcard photo spot. You can do this now but we recommend saving it for later in the day. Stay on the boardwalks first thing in the morning to beat the crowds and then visit these much less crowded viewpoints midday. Walk back to the main trail and follow the signs to A, B, C, K.
The boardwalks and trail markers. You will come to another detour, which is optional. You can climb a long series of slippery steps up through a dark cave (Supljara Cave). From the top of the cave, follow the trail out to the upper level of the cliffs for an awesome view over the park. This is the most strenuous part of the day but if you want this view, it’s worth it. 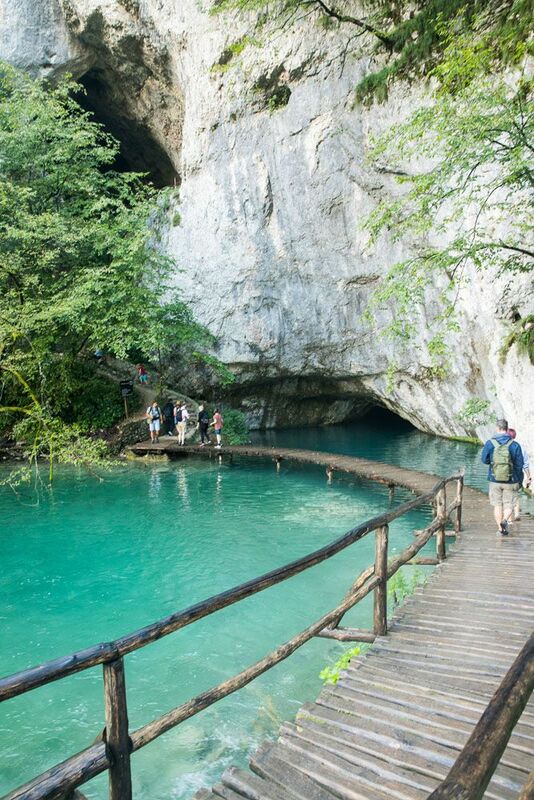 If you hiked up through the cave, retrace your steps back down the lower lakes and then resume the trail to Lake Kozjak. Ride the boat across Lake Kozjak. 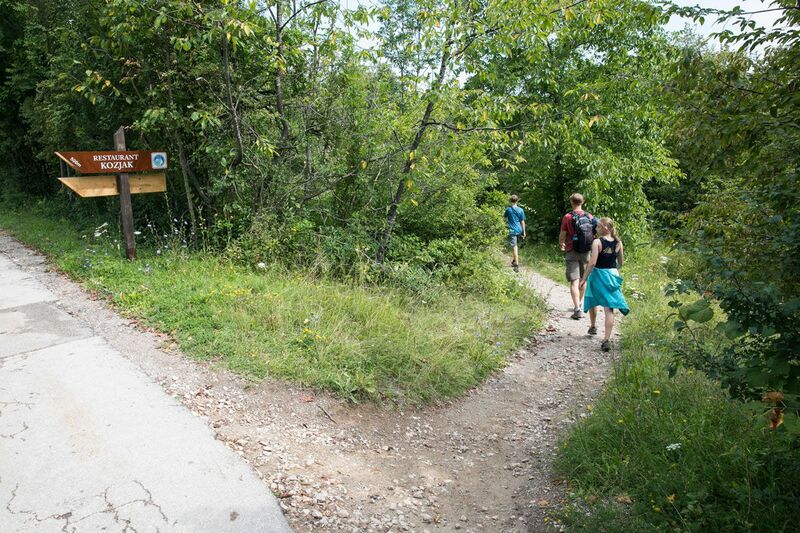 Follow the trails around the upper lakes, following the signs to stay on the C trail. This is a gorgeous part of the park with trails and boardwalks criss-crossing over the lakes. Once you arrive at Station 3, take the shuttle to Entrance 2. Then, take the boat back across Lake Kozjak. Now we are going to several viewpoints along the lakes. When we did this, we were the only ones on this hiking trail. From the dock, walk a short distance back in the direction of Entrance 1. You will see a road branch off from the trail on the left. Follow this road uphill. Once it levels out, you are now walking along the upper cliffs on the western side of the lakes. There is a hiking trail in the woods between the road and the cliffs. Take this trail and follow it north. Along the way you will come to several nice viewpoints along the lakes. The view from the final viewpoint near the top of Veliki Slap. This is looking towards Entrance 1. At the last viewpoint, you can walk down a steep staircase to get back to Veliki Slap and walk to Entrance 1 from here. 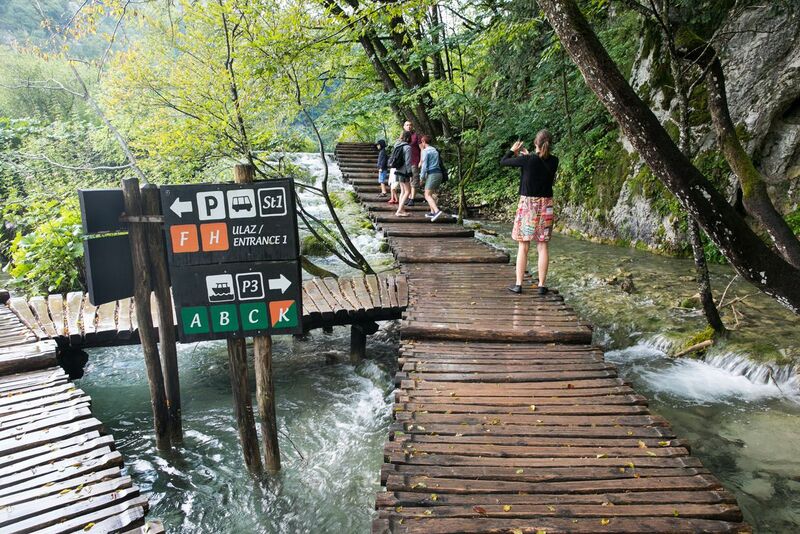 Or you can keep going to get to the postcard viewpoint over Plitvice Lakes. Walk back to the road, continue north, cross a small wooden bridge, and then you will see another hiking trail on the right. It’s a five-minute walk on the trail to the viewpoint. A zoomed in photo of the boardwalk trail to Veliki Slap. 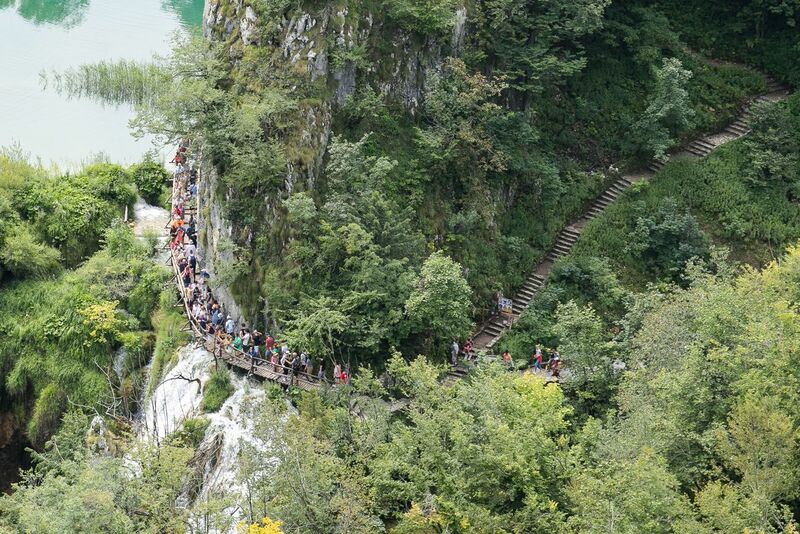 Not only can you see how crowded the trails get midday in Plitvice Lakes but you can also see the steps leading uphill to the trail along the cliffs. To get to Entrance 1, backtrack to the steps leading down to Veliki Slap and walk to Entrance 1 from here. This entire route will take 6 to 8 hours. Bring a picnic lunch to have along the way. One of the quiet viewpoints overlooking the lakes would make a nice picnic spot! Important Note: During our visit in July 2018, construction was being done on the steps leading down to Veliki Slap. We were not permitted to walk on these steps during this time. 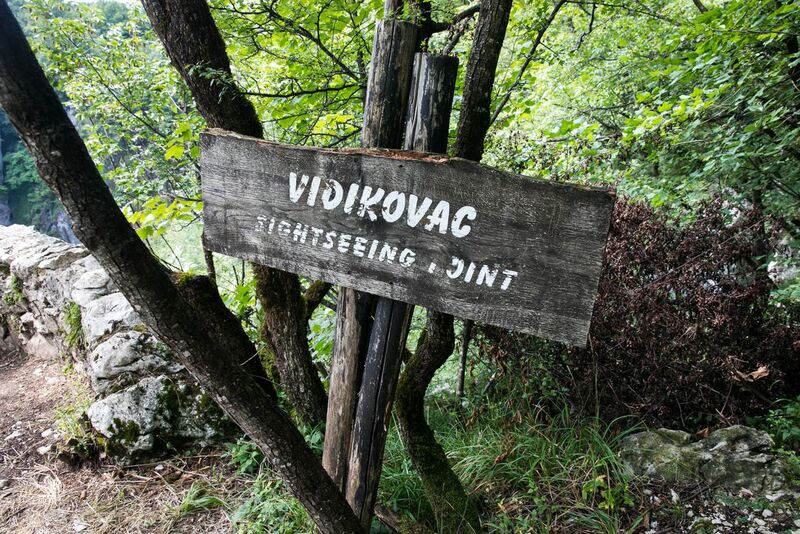 If the steps are still closed during your visit, then you will have to backtrack down the road to Kozjak Lake and walk back to the entrance from here. So make sure you really want this view before you walk out this far. By the way, if you have recently done this, feel free to comment below if the steps are open or closed. Thanks!! So, what if you don’t want walk that far? You can drive to the viewpoint. Here are the GPS coordinates for the trailhead: 44°54’9″ N 15°36’27” E. There are several parking spaces along the road here. During the summer months the park is open from 7 am to 8 pm. In spring and autumn the park is open from 8 am to 6 pm and in winter from 8 am to 3 pm. These hours can vary so it’s a good idea to check the hours on the official website. 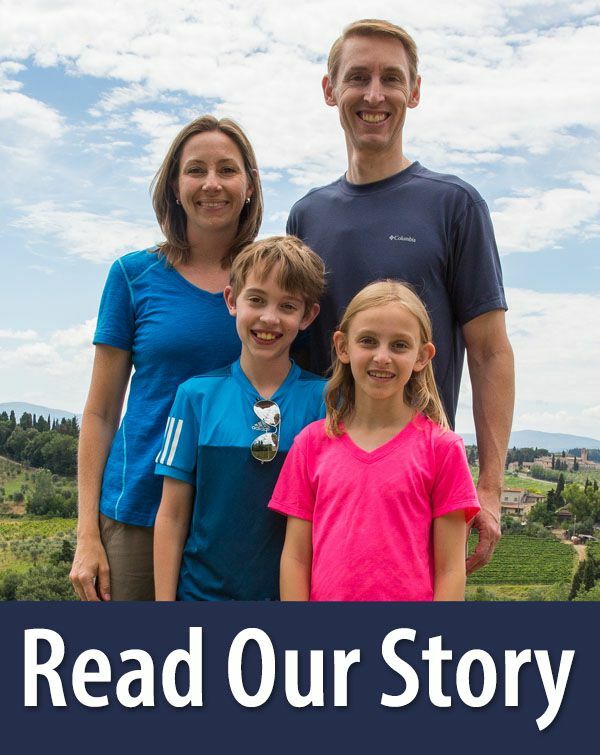 The cost for children ages 7 to 18 years is roughly half the cost of an adult. Children 6 years and under are free. The entrance fee includes unlimited trips on the electric boat and the shuttle. There is an additional fee for parking: 7 kn per hour per automobile and 70 kn per day for a camper. 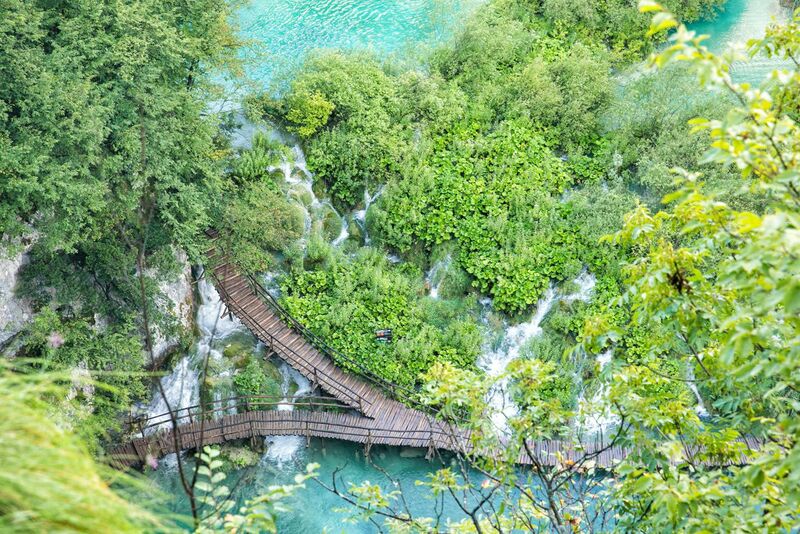 Plitvice Lakes is a year-round destination. It is open 365 days of the year. The summer months are the busiest time to visit the park. Expect congestion on the boardwalks and hot temperatures. Water levels tend to be lower during the summer months so the waterfalls may not be as impressive. We got lucky and it rained overnight right before our visit. 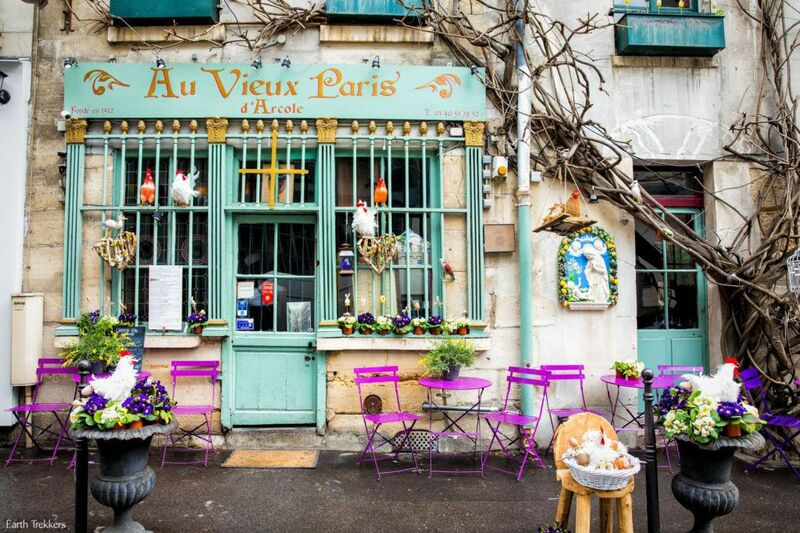 Spring and autumn are the best time to visit. Crowds are lower and the waterfalls are roaring during the spring months. In autumn, you can capture the lakes with the fall colors. Winter is a totally different experience. Crowds are generally low and if you are really lucky you will get to see Plitvice Lakes with a layer of snow. 1. Get here at opening time. Experiencing the boardwalk trails during the quiet, crowd-free morning hours is almost magical. By 10, the trails become quite packed once the day trippers arrive. 2. Stay overnight near the park. That way, you can get here at opening time! 3. Bring a picnic lunch. There are a few restaurants in the park but doesn’t this seem like the perfect place to have a picnic lunch? 4. Start at Entrance 1. As you walk up the paths you will have better views of the waterfalls than if you start at Entrance 2. 5. Be patient. During peak times, the boardwalks become clogged with visitors. It can be slow going during these times, as people stop to take photos and enjoy the view. 6. Swimming is not permitted. This is a UNESCO site so swimming is not allowed here. 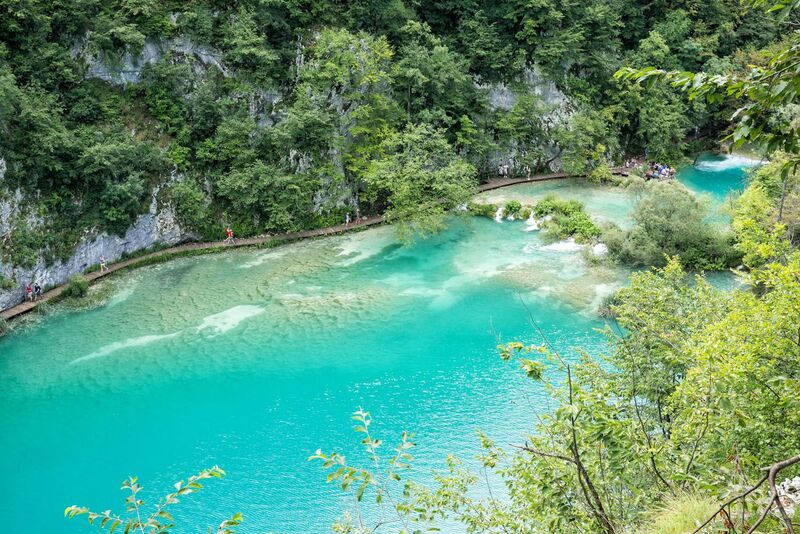 However, Krka National Park is a similar experience to Plitvice and swimming is permitted here. There are two lodges in Plitvice. Hotel Jezero is a 3-star hotel located near the park entrance. Hotel Plitvice is budget hotel located near Hotel Jezero that gets good reviews. You can also stay in a room in a private home. We stayed at Apartment Ivano, located 15 minutes north of the park entrance. We had a two-bedroom apartment that was the upper level of the hosts’ house. It is very basic but it was a nice experience staying in rural Croatia with views of the countryside. Other apartments in the area that get great reviews are Apartments Bramado, Guesthouse Franjkovic, and BeaR’s LOG Holiday Home (this place looks really neat…check out the photos on Booking.com). 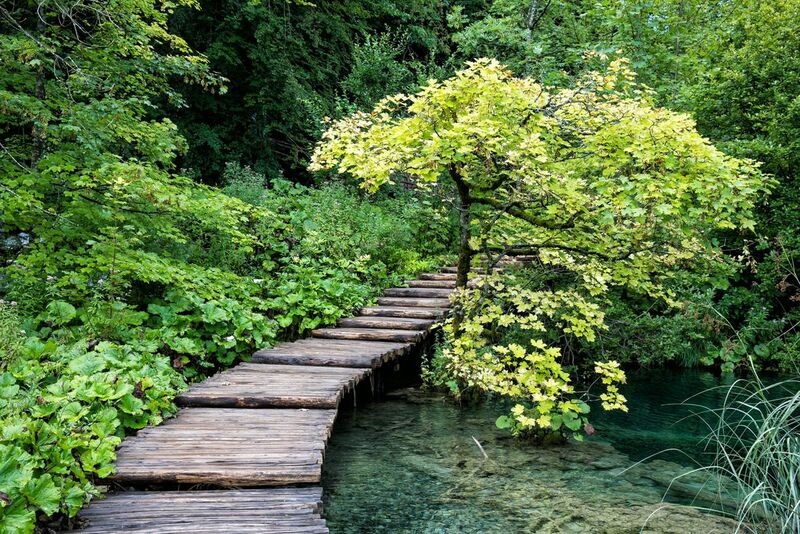 If you are planning your visit to Plitvice Lakes and have any questions or want to offer any suggestions, comment below! 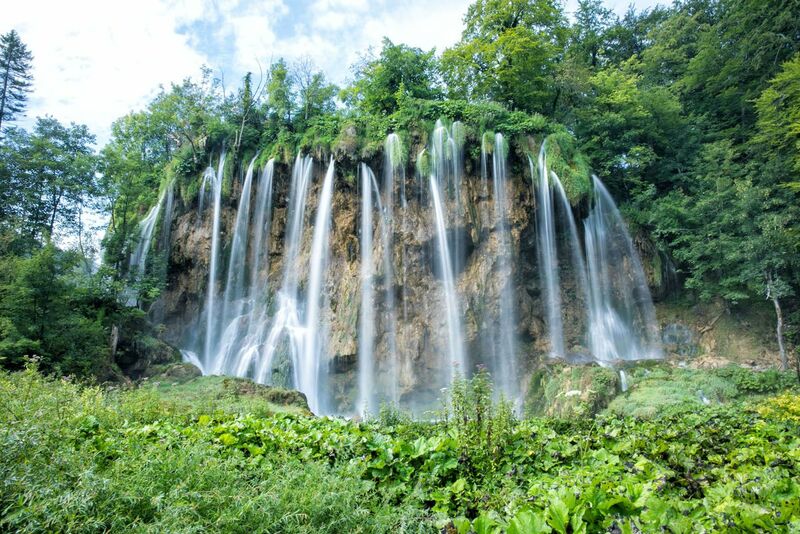 Me and my wife along with 3 other family members are planning to visit Plitvice park on 20th April 2019 (easter weekend) from Split. We will be staying in split and renting a car. So reaching at 7am is not feasible for us. Our plan is to start by 6:30-7am from split and reach the lakes by 10am. And start our return to split from the park by 5pm giving us roughly 6-7 hours to explore the lakes. 1. Should we expect heavy crowd due to easter holidays? 2. Can we cover both upper and lower lakes in the time we have? Hello Julie and family, me again. Our plan is to leave Split in the morning and drive via Skradin going into Krka National Park on route to Plitvice Lakes, arriving late afternoon/early evening. We will then have 2 full days to see the park and surrounds, staying at Apartments Bramado in Seliste Dreznicko. With what looks like to be plenty of time, would you suggest splitting up your suggested itinerary between the 2 days so both can be started at 7am or would you perhaps suggest something else for our second day?